JOIN US AS OUR STREETS COME ALIVE! 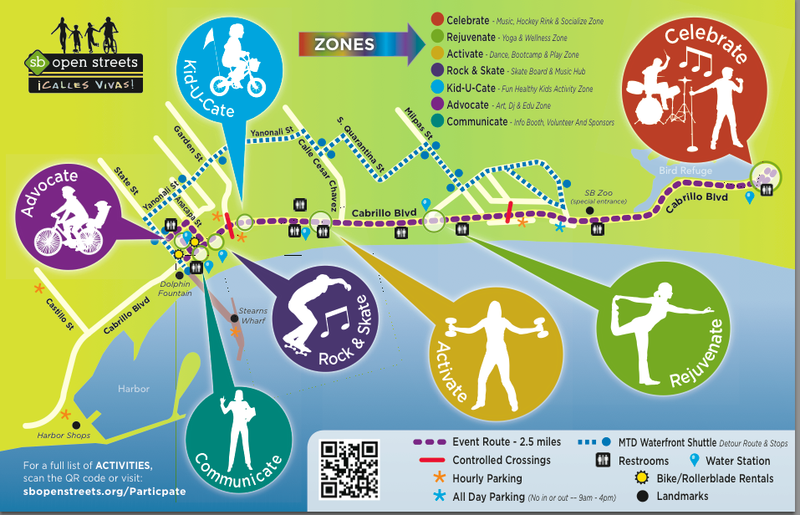 Saturday, Nov 2nd, from 10 am – 4 pm, the streets become our longest public park with over 2.5 miles of Cabrillo Blvd and part of the Funk Zone transformed into a celebration of people-power to promote better health, flexibility and FUN! No cars – no fumes – no traffic, just the open roads filled with walking, biking, skating, moving and doing! Be here this Saturday and plan to have a blast! Discover new dimensions of swing dancing with this class on Helena Street! West Coast Swing can be funky or lyrical, and danced to every kind of music! Opera Santa Barbara invites you to catch a free sneak preview of ‘Tosca’, one of Puccini’s greatest operas! Sign up for a free raffle of two tickets to the opera! La Colina Junior High School’s Outburst! An award-winning show choir of twenty-eight 12-14 year old performers! Diane Ippel performs vocal and instrumental traditonal, contemporary and original music utilizing hammered dulcimer, autoharp and guitar. Vibrant Mexican folk music for Dia de Los Muertos! Working to lower carbon emissions and keep our climate safe. Learn about the significance of 350, and what it means for where we need to be as a planet. Discover your passion! Classes start throughout the term. Information and registration details for 400 classes to be offered this coming Winter. Check out sample electric bikes and rental options that make getting around town easy! Take a ride back in history with Rex Stevens’ nostalgic bicycle collection. Learn about our programs for bicycle enthusiasm and advocacy. Get info about the many programs to support the health and equal rights of the LGBT members of our community. Learn about our nutrition programs, volunteer opportunities, and enjoy fresh bicycle-blended fruit smoothies! Check out one of our sailboats, learn about nautical knot tying and the thrill of sailing the ocean!